Beautifully crafted for your special occasion, wedding umbrellas from Susino have a timeless elegance. Available in white and ivory, pretty florals, and simple pastels, all our colours add a chic look to any wedding attire. Our stylish umbrellas are ideal for keeping rain showers from spoiling the day. Perfect for adding some bygone chic to your photo shoot, and as a beautiful keepsake for your special day, our umbrellas are a wedding day essential. Here at Susino, we’ve created a wide range of fashionable umbrellas to choose from, and we guarantee next day delivery on orders placed before 2pm. Our white wedding umbrellas combine fashion and function to make sure you stay dry whilst looking fabulous on your wedding day. Whether it’s April showers during your photo opportunity, or a snow flurry threatening your big entrance, we’ve got you covered. These unique accessories are the perfect addition to any photo shoot, and make a gorgeous keepsake for bridesmaids. With a high fashion Susino wedding umbrella for the bride, you’re sure to turn heads on the big day. Our umbrellas keep you picture perfect for a lifetime of memories on the day you said, ‘I Do’. Susino’s white, ivory or stunning frilled black parasol adds a touch of bygone elegance to your perfect day, furling shut to make a pretty accessory when the rain stops. For the groom and entourage, a stylish black umbrella is sure to keep even the heaviest showers at bay. And for the all-important wedding guests, umbrellas in bright florals, pastels and up to date prints draw inspiration from the catwalk to add flair to your wedding outfit. If you’re looking for a splash of colour during a downpour on your special day, this is the ideal accessory for your wedding outfit. 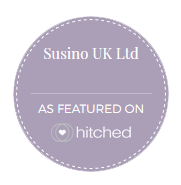 With over 30 years’ experience in the industry, Susino is one of the UK’s largest fashion accessory companies, and we continue to strive for excellence. Our beautifully manufactured wedding umbrellas are made to the highest standard, featuring crook handles, a strong fabric canopy, and a hardy steel frame. When you buy an umbrella from Susino, you’re buying direct from the manufacturer. Take advantage of free delivery on orders over £30 - plus guaranteed next day delivery if you order before 2pm.